The Shure model WL93 Microphones are economical omnidirectional, subminiature, lavalier, condenser microphones designed for general speech applications where a visually unobtrusive microphone is desirable. All WL93 models are supplied with a mounting block with attached tie bar, a sew-on mounting bracket, and an acoustic windscreen to minimize wind noise in outdoor applications. All WL93 models include a cable terminated with a 4-pin mini connector which connects directly to a Shure wireless body-pack transmitter. NOTE: The "T" in this model's number SHWL93T indicates that this is a tan colored lavalier microphone and cable. Subminiature lavalier design; ideal size for theater, television broadcasting, video, film, and sound reinforcement. Full, clear sound comparable to larger microphones. Smooth extended frequency response with presence rise specially tailored for chest-worn microphone operation. Controlled low-frequency roll off reduces low-frequency clothing and room noise. Low distortion, wide dynamic range. Tan colored lavalier microphone and cable. Applications Wireless Videography, Radio, Television and Broadcast. 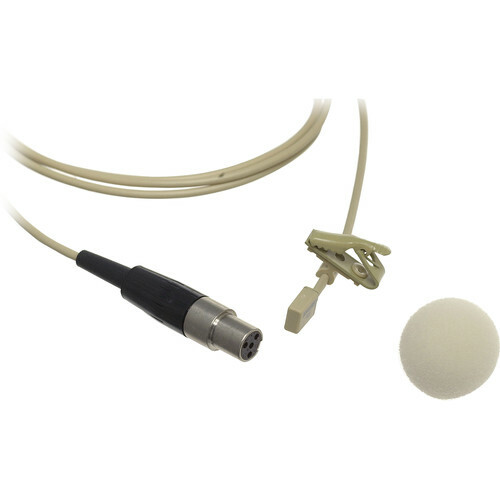 Box Dimensions (LxWxH) 6.6 x 4.4 x 3.2"
WL93T Professional Micro-Lavalier Omni Mic (Tan) is rated 4.6 out of 5 by 25. Rated 4 out of 5 by Whisel from Great mic I ordered this mic to serve as a backup mic in my video deposition kit. I've been using this microphone for the past 6 years without any problems. In my situation, the microphones pickup voices very well in nearly every environment. When they are properly placed on a deponent, the microphones pickup voices clearly and accurately. My only negative comment is that in some situations, the microphone is a little too sensitive and picks up a little too much background noise and that requires that I keep the gain trimmed down below the usual setting. Otherwise, it's a great microphone. Rated 5 out of 5 by Anonymous from Good stuff! Replacement of the same model due to cable noise after years of continuous usage. Rated 4 out of 5 by Anonymous from Slim with a GREAT sound WL93 Professional Micro-Lavalier Omni Mic We are church that has many speaker come in from all over the country. This mic is used for traveling speakers every week. It gets banged around, left behind and dropped. The cool thing is for the low cost, it takes a lickin but keeps on tickin will great voice clarity. I would recommend this product to anyone that has a similar need! Rated 5 out of 5 by Anonymous from I would purchase the item again. The product is used in church. The sound quality is excellent. Especially when the person turns their head the mic still picks up the voice. The product is very well built. I have no complaints or problems with the product. Rated 5 out of 5 by Ryan from Quality, Reliable Sound The 93 is a great all around lav mic. It produces clean, crisp sound, is well constructed, and relatively affordable. It's my go-to wired mic. Rated 4 out of 5 by Bill from Thanks Excellent mic from Shure and excellent service from B&H, what could be a better combination? Rated 5 out of 5 by Sgw from Great product I use these for recording interviews. Is this compatible with the Shure wired SM93 Preamp? Yes, the SM93 preamp (part number 90A4360) is compatible with this microphone for use in wired applications. Please note, however, that for wireless use, the preamp will not be needed as it will be powered by your bodypack transmitter. Do they have this in a mini jack version, so I can connect it to my h1? A Zoom H1 will not support the necessary power requirement for a Shure WL93. The WL93's condenser element requires 5+Vdc to operate whereas the Zoom H1's powered 3.5mm input provides only 2.5 volts of plug-in power. To ensure compatibility with your H1, you will need to select another plug-in mic that either has a condenser or MEMS style element with a lower power requirement or has a dynamic element requiring no power.